Ah...my little super heros all deserve their own super capes. 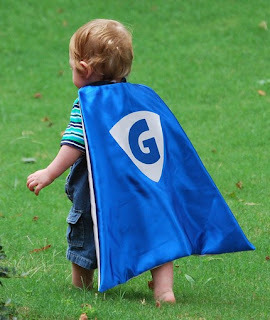 I mentioned this sweet idea when a friend of mine made her son his own birthday cape and here it is again. It comes at a time when dressing up and "flying" around the house is quite popular and a particular cousin is more often seen in his Spiderman muscles than his own skinny bod.